Mozzarella was introduced in Australia through Italian migration. Today, supported by Australian dairy producers and high quality standards, it is integral part of Australian daily diet. 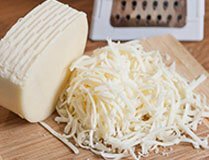 This cheese is known for its superb elastic consistency. It has stringy, supple or springy texture. It has excellent melting properties, making it suitable for baking dishes such as pasta, pizza and lasagne.